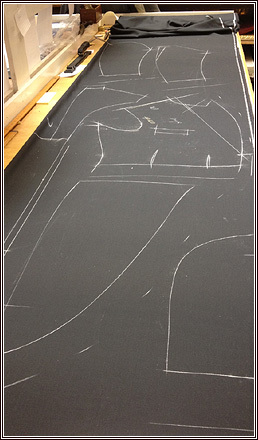 Mr Hitchcock has been working with myself and Ollie recently to learn the lays for white tie – how you arrange all the various parts of the coat and waistcoat out on the cloth. While the forepart (centre of the photo) has some similarities with a normal coat, it cuts off at the waist and you can see the two darts it has on the bottom edge. The tail attaches to the forepart just behind that front dart, so the coat cuts across horizontally before sweeping down into the tail. Anderson & Sheppard probably only makes a dozen sets of white tie a year, but it’s important to know the lay and it’s also nice to learn a variation on a normal coat. We make a lot of morning coats for Ascot and other events, but that shape is slightly different, with the forepart running straight down into the tail – the tail part you can see above would be slightly wider on a morning coat. Mr Hitchcock showed us some images online of people wearing white tie, and the mistakes they make. For some reason ready-to-wear white tie is often made with the waistcoat longer than the coat, for example, which looks very sloppy. He also told us that Anderson & Sheppard used to make white tie with a notch lapel, and that was something that differentiated us from other tailors. But over time we gradually switched to a peak lapel as a greater proportion of customers requested it. It’s interesting to know that there used to be such variation in what is seen as a very classic, formal outfit.